Beginning this fall, Dog Tag Brewing's "Legacy Lager" will be distributed nationally by Pabst Brewing Company. Dog Tag Brewing donates 100% of its after-tax profits to the Dog Tag Brewing Foundation, which benefits charities created or selected by Gold Star Families. Seth Jordan, a Marine combat veteran, founded Dog Tag Brewing in 2014 with an invitation for the American public to "Toast a Hero" as they read the name of a fallen warrior printed on each can. Today, Seth serves as Chairman of the Dog Tag Brewing Foundation, a non-profit organization dedicated to supporting legacy building projects started or selected by Gold Star Families, the families of fallen military personnel. Dog Tag Foundation will provide grants to Gold Star family charities and offer free consulting services to help families create impactful, sustainable organizations in honor of their loved ones. "The partnership with Pabst will ensure that millions of Americans will have a chance to try our beer and to join us in helping Gold Star families build the legacies of our nation's fallen military heroes," said Jordan. "Our mission is simple: to help Gold Star families make sure their loved one is never forgotten." "Mario was always focused on helping the people in his community. I am proud to partner with Dog Tag to start a Foundation in Mario's name and to honor his legacy," said Jennifer Carazo, Gold Star Wife of Lieutenant Colonel Mario "Sugar Bear" Carazo on establishing the Sugar Bear Foundation. 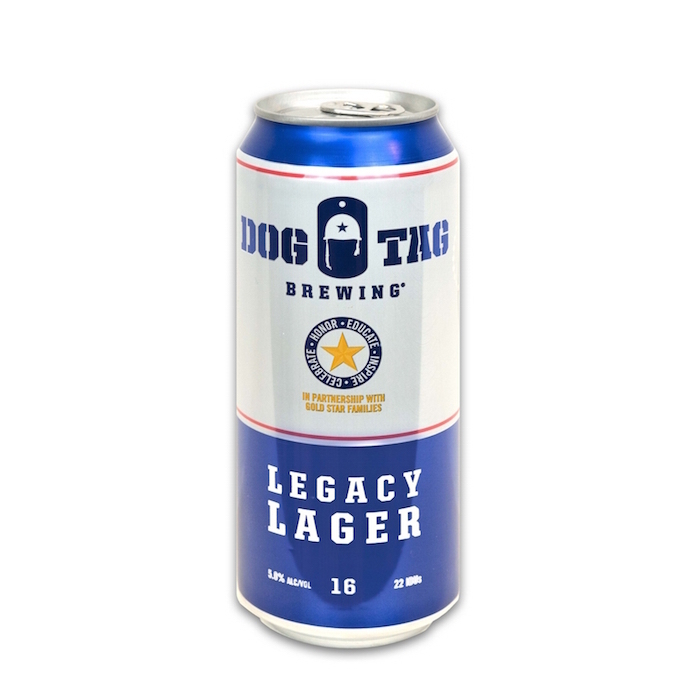 Dog Tag's "Legacy Lager" is brewed with premium quality 2-row pale and specialty malts, Magnum and Saaz hops, and is fermented with a timeless American lager yeast. It is a 5% ABV brew with 22 IBUs, and will be available in 4-pack 16oz cans. Dog Tag utilizes a groundbreaking can printing technology to dedicate each can within a 4-pack to a different fallen warrior. Eugene Kashper, CEO of Pabst Brewing Company stated: "We are really excited to partner with Seth and Dog Tag. Seth's passion for remembering, honoring, and celebrating our nation's heroes is inspiring. We are truly honored to have the opportunity to support Gold Star families in their charitable endeavors and to help spread Dog Tag's message nationwide." Dog Tag's Legacy Lager will be available in 26 states beginning September 1, 2016, with national distribution in 2017. Dog Tag Brewing Foundation is a 501(c)(3) nonprofit organization that is dedicated to building the legacies of America's Fallen Warriors by partnering with Gold Star Families – the families of our fallen military – on legacy-building projects that carry on the memory of their loved ones. Dog Tag Brewing Foundation supports these projects through grants and free consulting services, and then aims to inspire Americans to get involved by sharing stories of service and sacrifice through social media and on individualized dedication cans of Dog Tag Legacy Lager. Founded in late 2015, Dog Tag Brewing Foundation is supported by the generosity of the public and by its subsidiary, Dog Tag Brewing, LLC, which donates 100% of its profits to Dog Tag Brewing Foundation. To date, Dog Tag Brewing Foundation has amassed a social media following of over 125,000, has given away $120,000 in grants and services, and expects to eventually grow to support up to 1000 different Gold Star charities after the beer's successful national rollout. Please visit www.dogtagbrewing.org to learn more. Since 1844, Pabst Brewing Company has been American-owned and operated, and is North America's largest privately held brewing company. Pabst's portfolio includes iconic brands with deep ties to America's heritage, such as its flagship Pabst Blue Ribbon and others such as Lone Star, Rainier, Ballantine IPA, Schlitz, Old Style, National Bohemian, Stag, Stroh's, and Old Milwaukee. For more information about Pabst, please visit www.pabstbrewingco.com.